Whoever wages war against the Government of India, or attempts to wage such war, or abets the waging of such war, shall be punished with death, or imprisonment for life and shall also be liable to fine. Whoever abets the committing of mutiny by an officer, soldier, sailor or airman in the Army, Navy or Air Force of the Government of India, shall, if mutiny be committed in consequence of that abetment, be punished with death or with imprisonment for life, or imprisonment of either description for a term which may extend to ten years, and shall also be liable to fine. if innocent person be thereby convicted and executed.— and if an innocent person be convicted and executed in consequence of such false evidence, the person who gives such false evidence shall be punished either with death or the punishment hereinbefore described. Whoever commits murder shall be punished with death, or imprisonment for life and shall also be liable to fine. Whoever, being under sentence of imprisonment for life, commits murder, shall be punished with death. 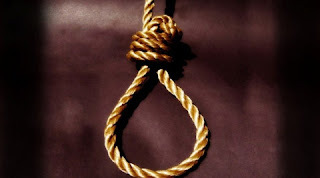 If any person under eighteen years of age, any insane person, any delirious person, any idiot, or any person in a state of intoxication, commits suicide, whoever abets the commission of such suicide, shall be punished with death or imprisonment for life, or imprisonment for a term not exceeding ten years, and shall also be liable to fine. Whoever does any act with such intention or knowledge, and under such circumstances that, if he by that act caused death, he would be guilty of murder, shall be punished with imprisonment of either description for a term which may extend to ten years, and shall also be liable to fine; and if hurt is caused to any person by such act, the offender shall be liable either to imprisonment for life], or to such punishment as is hereinbefore mentioned. Attempts by life convicts.—When any person offending under this section is under sentence of imprisonment for life, he may, if hurt is caused, be punished with death. 1[Section 364A - Kidnapping for ransom, etc. Whoever kidnaps or abducts any person or keeps a person in detention after such kidnapping or abduction and threatens to cause death or hurt to such person, or by his conduct gives rise to a reasonable apprehension that such person may be put to death or hurt, or causes hurt or death to such person in order to compel the Government or any foreign State or international inter-governmental organization or any other person to do or abstain from doing any act or to pay a ransom, shall be punishable with death, or imprisonment for life, and shall also be liable to fine]. If any one of five or more persons, who are conjointly committing dacoity, commits murder in so committing dacoity, every one of those persons shall be punished with death, or imprisonment for life, or rigorous imprisonment for term which may extend to ten years, and shall also be liable to fine.